Tanya Harrison is a planetary scientist, she is a PHD student in Geology at the University of Western Ontario. She works mostly on collecting data for and from Mars. Aside from all of the hard work she does with Mars she is a professional photographer. Yesterday in science class we joined Tanya in a Skype call and talked to her about outer space and what she does in her job. Everyone in the class asked her some questions to further our understanding about space. Some other things that I learned from our Skype call is that the rovers have found evidence of liquid water on the surface of mars. They have found streams of salt left from the water after the water has evaporated. Scientists have also found out that the lost rover that they thought might have crash landed actually did land but malfunctioned during landing. Before this Skype chat I was very confused and disinterested about space and now coming out of this experience I would love to look more into space. Hi my name is chromosome 22. I live inside of a little girl named Ellie. Ellie was diagnosed with a minor case of Cat Eye Syndrome at birth, this is all because of me. I wad supposed to multiply by 2 like all of the other chromosome 22 in the world but I made a mistake and multiplied by 4, this was a mistake and sometimes these things happen. My gene was mutated hereditary, that means that Ellie’s mom or dads cells were passed down to her. Luckily for Ellie, the syndrome I gave to her could have been so much worse. I am weak compared to other chromosome 22 that I know of. Because of me Ellie has mental and physical problems. She has an eye deformity where her pupils are elongated and her eye lids are misshapen. Ellie will never be an average height, she will always be smaller then most other people. She was also born with a learning disability, it doesn’t affect her to badly but it does make it harder for her to learn. Ellie has to have frequent appointments with a multiple of different doctors and specialists to treat all of her conditions. She has weekly visits with the optometrist, neurologist and other specialists to keep her as healthy as possible. Even with all of this help she will still never know how long she will live, that is the thing I feel most guilty about, the fact that my stupid mistake might cause her he life. Although her diagnosis isn’t strong there are still possibilities in the future for her to develop heart, kidney and other fetal issues. When Ellie was born he parents were told that she would live a year if she was lucky but 11 years later she is still here. although currently there is no cure to Cat Eye Syndrome Ellie might just be lucky enough to live to see the day where a cure is found. Ellie has grown up not knowing what her life has lied ahead of her. Nobody understands, kids on the playground stair at her, run away or laugh all because of the way she looked. from a very young age Ellie has had a problem with the way she looks, it isn’t her fault that she looks different, it is mine. Last year Ellie moved to a special school so she can learn better and make friends that don’t only like her for her personality but can understand what she goes through. Because of this change she is living her potentially short life happier then ever before. What questions did you need to research in order to create your mutation story? How does cat eye syndrome affect a person? How is the gene mutation caused? What are some facts about cat eye syndrome? What is the life expectancy of a person with cat eye syndrome? What new or familiar digital tool did you use to work through this project? I used my school tablet for the research, writing and uploading of this project. What was the process you used to investigate this topic? I started by writing out all of the questions that i needed to research and found the answers individually. after research on cat eye syndrome i read about gene mutation so I had a good understanding on what i was going to write about. How did this process of completing this challenge go? what could you have done better? finding all of the information was difficult but as soon as i had all of the pieces writing the story was easy. I had a hard time understanding the websites because of all of the intricate language. after a while i started doing my research on kids websites so the wording was simplifified and easier to understand. 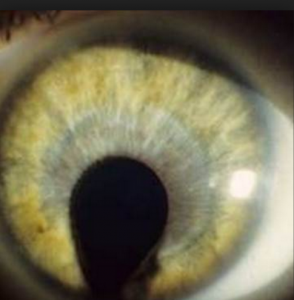 What are some other facts you found on Cat Eye Syndrome? As a group, Jamie, Athena and I came together to create a website for Karishma and her water filter. At the moment we are communicating with Karishma via email, discussing the website design and plans. Hear are some of our emails. 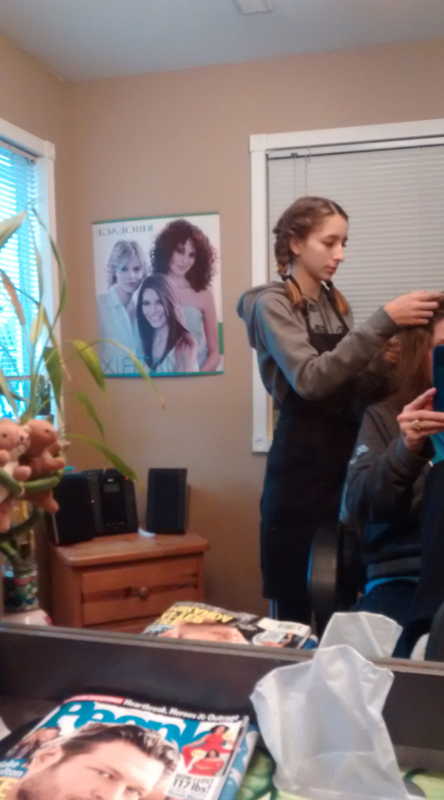 This is Jamie, Athena and Hailey from Mr Robinson’s grade 9 science class. We were really inspired from the Google Hangout the other day, and think that it is amazing what you have accomplished. We would love to contribute to your project; If you allow us, we plan to design and create a website to advertise your project and raise awareness on the issue. Hope you are well. Thank you so much for reaching out to me, and apologies for the delay in replying. I was off contact this weekend, and I just got back a few hours ago. I am so glad you enjoyed the hangout! It was wonderful speaking with all of you and truly motivating to see that you’re interested in saving the world! 🙂 I would absolutely love to have you on board and part of the team. It’s great that you want to create the website. Perhaps we could continue conversing over email, and share some ideas and designs for the website? Super excited to work with you and thank you so much for your dedication and involvement. Thanks for getting back to us,we are glad to have the opportunity to work with you, and excited to see what we can create with and for you. Our plan is to start the website design and run the details past you as we go. We would love for your opinion and specific requests so we can make this website the best it can be. Some things we plan to have on the website are, a biography or back ground information of you and your journey of your purifier, a space for donations, and pictures of the purifier and others you think might be beneficial to have on the page. We would like to give you access to the website as it is being made but we are not sure how that is going to work at this point. When we start building it we will let you know so we can figure out ways for you to get involved in the site making process. We cant wait till we start the creation, thanks for your time. Thank you for your prompt response. There are many ideas that we have, and I’m sure you have a couple at your end too. Perhaps we could start small and then as we go, we could incorporate other ideas. I would suggest using an online website creator, such as Wix or Weebly, unless you’d be interested in making the website using code from scratch. This might be more of a challenge but I would be open to it. For now, the ideas for the pages you have are great – that sounds perfect. Maybe you could start off by creating a general design/aesthetic theme for the website and then we could go from there? Also, our logo came out today, so I would love to have that on the site too. I’ll be sending out an email to all the schools that are involved with more info this weekend, and so stay tuned! Today we plan to start our layout using a website called Wix; We will start with a basic design and then send you what it looks like. Should we use your email to setup or create a new one? Do you have any suggestions for a password? We will come up with a simple and secure one if you do not have one. Hope you are well. Thank you so much for your email and for updating me on the progress of the website. You could use our email address ____________@gmail.com and then feel free to create a simple password of your choice. We can then change the username and details later on if need be. Thank you for keeping me updated and I really look forward to seeing the designs. Once they’re ready, we shall set up a time to talk and you could also get some feedback from the rest of the team and work with our artistic director. Thanks again and hope to speak to you soon! We are in the developing stages of the website right now, this means that we have started creating it but still working on getting the information onto the page and some other details. One of the things we would love to have of the website is a place for people to donate money although at this point we are not sure how that is suppose to work. Our current goal with this project is to raise awareness all over the world instead of just locally to make a bigger impact in this world. This project that we are working on is not only making an impact on the world but it is also impacting me as a person. It is making me step out of my comfort zone and use my head to think about each individual step. Starting this project I decided it would be beneficial to read about the problems that we are trying to help. After reading articles, websites and papers I have a newfound appreciation of everything that I have in my life, and I no longer take things for granted like I would have yesterday. Now instead of hearing about the struggles people are facing and feeling bad for them, I am making a contribution to one day end those struggles. I will no longer be the person that will stand aside and watch things happen. I will continue to post updates onto my blog as the website comes along and hopefully the impacts that we create. this is my passion and it will pay off. 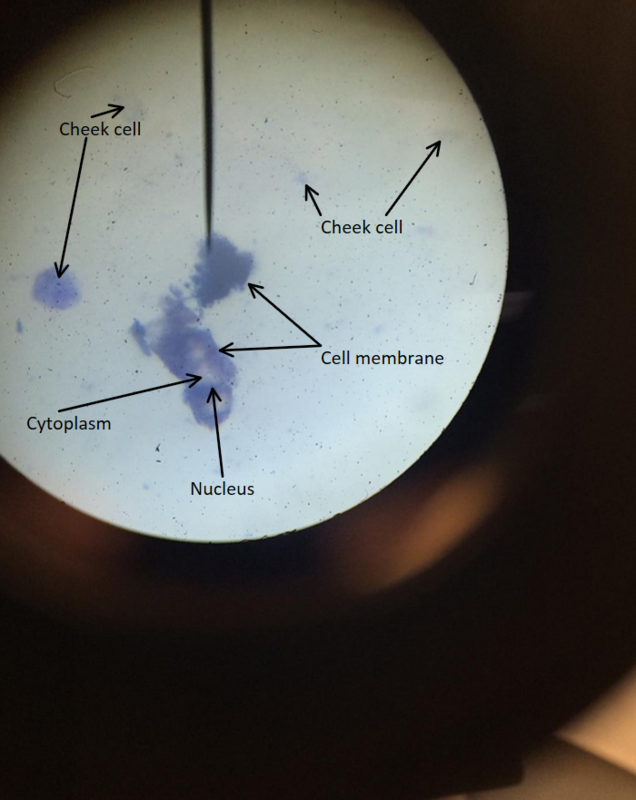 This is a picture of my cheek cell under a 400x magnification (40x nose piece). In this picture you are able to identify the cell membranes, nucleus, cytoplasm and other cheek cells. Under the 40x magnification you could see the cheek cells but with little detail. Under the 100x magnification the cheek cells became more viable but still lacked detail. Under the 400x magnification the cells became visible as seen in the image above. Although the image was difficult to identify at first we were able t0 see the cell membrane, nucleus and the cytoplasm under the 400x magnification. i learned from this lab that with one small swab of the mouth you are able to pick up billions of cells. Why were the Nucleus, cell membrane and the cytoplasm were the only things that were visible? what could have we done differently to be able to see more organelles? 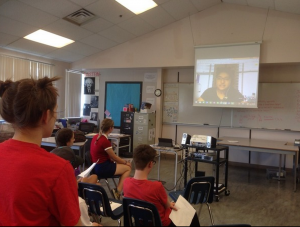 On April 19th we had a Google hang out with a student from NYU, Karishma Bhagani. Karishma grew up in Kenya and experienced the issues going on in Kenya and decided to dedicate time to make a change. She has made a water purifier to make the drinking water in third world country’s like Kenya cleaner and safer to consume. Being able to watch and experience this Google hang out was really cool and inspirational, just hearing about what Karishma has done really inspires me to do something good for the world. As a class and a community our goal is to come together and make a difference. Our first step in reaching out goal is to spread awareness of the issue at hand and the filter that Karishma has constructed. I would love to contribute to Karishma’s project. My personal goal is to get in touch with Karishma via email and help construct a website to raise awareness. Some of the questions we asked involved furthering the technology in the water purifier, such as making a filter that makes ocean water consumable. She explained to us that there is something out that will filter out ocean water but is takes far to much electricity and money to use at this point down in Kenya; she is working on expanding the project to make that dream of an efficient and affordable ocean filter come true. We asked Karishma about her inspiration for this project. She grew up in Kenya and knew the problems they were having. In middle school she was assigned a passion project and she decided to do it on Kenya. When she got into high school she made a decision to grow on this project and make it a reality to help save life’s in Kenya. He plan from here is to keep her product growing and eventually make it so everyone in need of clean water world wide will have access. Another question was,”what were some problems that you faced making this project?” Some of Karishma’s designs were flawed and had aspects that made the water contain bacteria. She tried chlorine in her filter but it was not successful as it did not completely clean the water. In the end she found that a vegetable called drumsticks worked to clean the water. In this picture Emily S was asking a question about the challenges that Karishma had faced through out her project.